I've eaten Ematei's food twice but only eaten in once. My lovely cousin H brought over Sushi all the way to the westend so she could keep me company with lil T one night. The other time, I popped over during a slow day for some lunch. It's a bit of a hike from the office for lunch but I'm always willing to try to find some good sushi. It was my goal anyhoo today, but in the end, I had Udon. H is always up for lunch so it's nice if I have a bit of extra time around noon to give her a call to meet up. She's eaten at Emi Tei a few times and recommended it because they have a lunch special. I'm always griping about the price of sushi in Toronto which is exacerbated by the dearth of Lunch combo specials. Who wants to pay 30 bucks on a few rolls at lunch? Emi Tei is tucked away just north of Queen Street on St. Patrick. I got lost coming over so after much pain in heels I found it. I rushed to sit down to a waiting cousin in the back so I missed the Lunch display at the front. That is critical, apparently. The menu is very cryptic and terse. The Japanese side seemed to have more words but for us, we had to ask the waitress what was in the Specials. Note on authenticity, most of the staff here are exchange students so their English is poor to not so poor. Trying to have our server try to describe what an Oshinki Roll is was a bit... awkward. Thing is I know what an Oshinki Roll is but she was so soft spoken, I couldn't catch it. All of this could have been avoided if I hadn't gotten lost and gotten blisters on my feet and had to rush to sit down, and had taken the time to look a the sample plates of the Specials of the day at the front door. :^D. They actually didn't have too many Sushi Specials per se. They had some combos that were on the pricey side for Lunch. Not that I can't afford it, so I'm clear. But on principle, try not to spend more than pre tax of 15 bucks on the main dish for lunch. You're looking at a final bill after tip of nearly 30 bucks if you do; 15 bucks for 10-12 pieces of sushi is too much for lunch. The few combos they did have that were in the 12-15 range all had what I call, filler rolls: Kappa (Cucumber), Oshinki (Pickle) or small Tekka (Tuna). That said, I'll give them some kudo on authenticity. They did not have alot of the trendier or themed rolls. They could and I like some and some not, but they chose to keep it 'simple'. The Sushi that H brought over a few weeks ago, mainly Nigiri and a couple of Maki, were yummo. Nice sized pieces and the rice had decent flavour. Mmmm Unagi (eel), I love Unagi. Theirs was not drowned in terrible congealed sauce like I've seen in others. They had a Bento Box that was well priced but the protein was a Chicken Katsu and they wouldn't sub the Ebi which was the same price. Oh well. H got the Bento special. It came with a small Salad, nice sized Tempura plate, Miso, Steamed Rice and a small Oshinki Roll. Great deal. They even gave her the sauce on the side. The amount of Tempura for the box was surprising too. 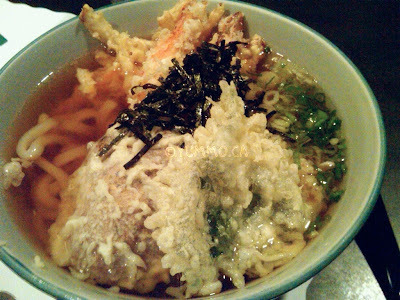 In the end I ordered the Udon because their Tempura looked so good and their Sushi was not Lunch friendly prices. This is the first time I've had this. I've always been curious about putting wonderful crispy Tempura in a Soup. I mean, do you eat the Tempura really fast? There's nothing in the soup other than the broth and the noodles. I decided to eat as I went. 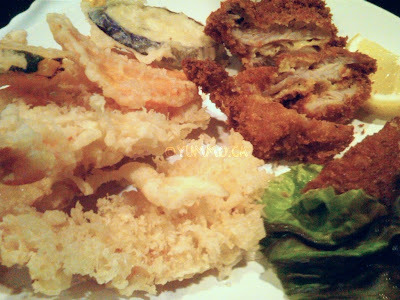 Some Tempura was still crispy and some got soggy but in a comforting way like dumplings. The thing that was a stand out for me was the Tempura Shitaki Mushroom. This was the first time EVER that I've had a cooked Shitake Mushroom that wasn't rubbery. I gingerly bit into it worried that I'd have to pull away carefully so as not to splatter myself with broth. I needn't have worried. It was very tender. The broth was okay. It had good flavour but I thought it tasted like one component was instant. It had a slight after taste I can't pinpoint. But, in general, it was a nice lunch.